Gibanica is sometimes called Burek (cheese pie). It was summer. I was in university and my boyfriend had a Serbo-Croatian next-door neighbour (his dad was Croatian and his mom was Serbian) who was his best friend. They used to hang out every day and would eat at each other's homes quite often. Days were spent talking about cars and puttering around his garage as he fixed his old '64 Firebird. The car was more Bondo than metal. It was so cool though. We drove down to Ambleside, cruised down Robson Street and walked along the Stanley Park Seawall during those warm summer nights. Summers were full of barbecues and inevitably I would be invited to their big parties. The house was full of people from all generations, chatting, playing pool and helping with making the food. The tables were loaded with grilled chicken, grilled meat, a savour monkey bread, a cheese strudel, tomatoes, onions, cucumber salad and much more. Everything was made from scratch. His mom was the best cook ever. 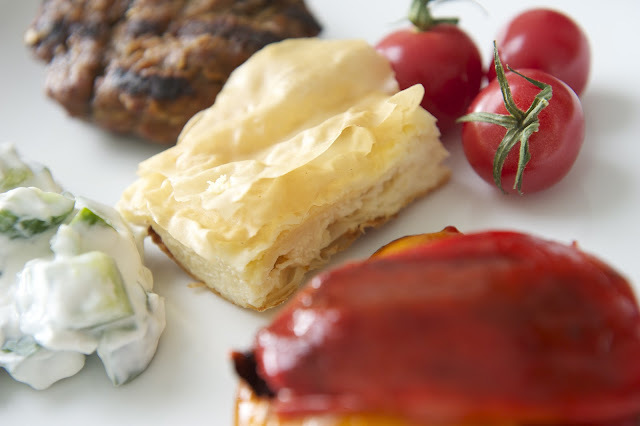 The iconic foods that were a mainstay at all the barbecues were the Savoury Cheese Pie (Gibanica [Gee-ban-itsa]) and the Grilled Meat patties (Pljeskavica [Plyess-ka-vee-tsah]). My boyfriend had once asked his buddy for the recipe, but didn't get a response. The recipes were well-guarded family secrets passed down through the generations. I encountered a similar response from my Portuguese girlfriend's family when I inquired about a fried shrimp empanada-like appetizer. I never bothered asking anyone for their amazing recipes again. I knew they wouldn't divulge. I just tucked those tastebud memories away with the faint hope that I might encounter an authentic recipe sometime in the future. Bake until the bottom and top is golden brown. When I got married to my boyfriend, and his best friend became his Best Man, we moved out into our own townhouse and we no longer hung out at his parents' house and I no longer ate the Serbo-Croatian foods that so resonated with me the smells and feelings of summer. Today, lately since Stomach bought a new barbecue, (Weber!) I have been having nostalgic yearnings for the meat patties and custardy savoury cheese pies of my youth. 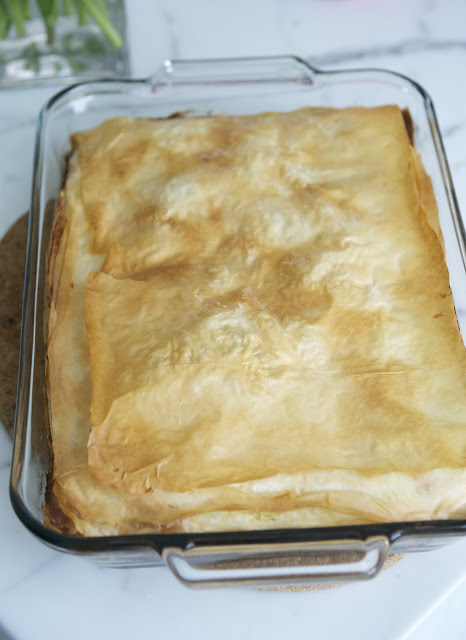 Though Stomach would often watch his best friend help his mother with the layering of the phyllo for the cheese pie and we would sit at the kitchen table as he helped make the meat patties and then grill them on the bbq, the thought never crossed my mind that I should be taking mental notes. My bad. 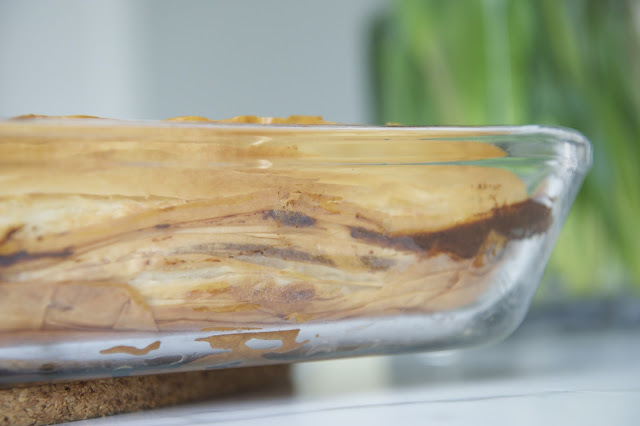 Use a pyrex baking dish to bake the Gibanica so you can check that it is golden brown on the bottom. From Stomach's recollection, there were 7 different cheeses in that Gibanica (or Burek) dish. Apparently, the layering of the Gibanica would take a long time and it was his friend's job to do it. 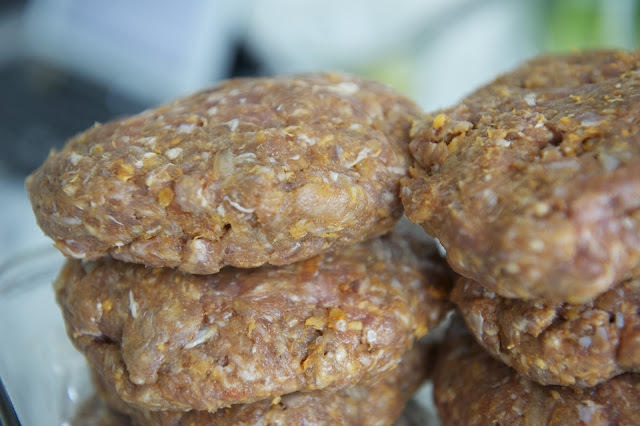 I personally recalled some sort of dehydrated vegetable concoction that was sprinkled into the raw meat patty mixture. There are no Croatian or Serbian restaurants around Vancouver that I know of (let me know if there are!) and I suspect this is because the moms know how to cook so well...so why bother? Other than befriending way more Croatian and Serbian friends in the hopes of being invited to their awesome bbq parties, the only way I figured I'd get to eat these tasty dishes whenever I wanted was to get to work researching and testing recipes. I realized that I'd have to get going on researching the recipes that I longed for...on the internet. Interestingly, none of the recipes I found were exactly as I remembered. None of the Gibanica recipes called for 7 different cheeses. The recipes I found had at most 3 different cheeses. The Pljeskavica recipes were so simple and didn't call for any of those dehydrated veggies...that I wondered if they were truly authentic. In the end, I found a product called "Vegeta" that was invented in Croatia. Apparently, it is as ubiquitous as ketchup in North America. So I suspect that Vegeta (which has an MSG and non-MSG version) is the product that my friend used in his meat patties mixture. I also think the Vegeta he used had MSG in it because his Pljeskavica were soooo good! Allow the ground meat mixture to sit covered in refrigerator so flavours will meld. I did this overnight. In the end, I cobbled together my own recipe from the myriad of recipes out there. I used a technique from one recipe and some ingredients from a few other recipes and kind of guessed at the proportions. These two super tasty dishes are my faves for barbecues. The sides will have to wait for another day's post as this one's getting pretty long on its own. I will be tweaking the recipes this summer until they come out the way I remembered. The Gibanica was a bit too dry for my liking. This recipe was very good but not amazing! I will be trying to make it more rich and custardy as I recalled it (and maybe add a few more cheeses? possibly 4 more? and use butter instead of olive oil). I think the calorie counts will be going up for the cheese pie. The meat patties are almost perfect. I need that Vegeta seasoning mix. Next time I have to form the patties differently...thinner and indented in the middle. Gotta look around for the Vegeta somewhere. Doubt Safeway has it! In a food processor, pulse the feta until crumbly. Add the ricotta, sour cream and 2 eggs. Continue to pulse until the mixture is thoroughly combined. Add the club soda or mineral water. Pulse again to combine. Butter, oil or spray a large pyrex rectangular baking dish. Save 4 sheets of phyllo; setting it aside for the "lid" of the strudel. Cover with a towel so it doesn't dry out. 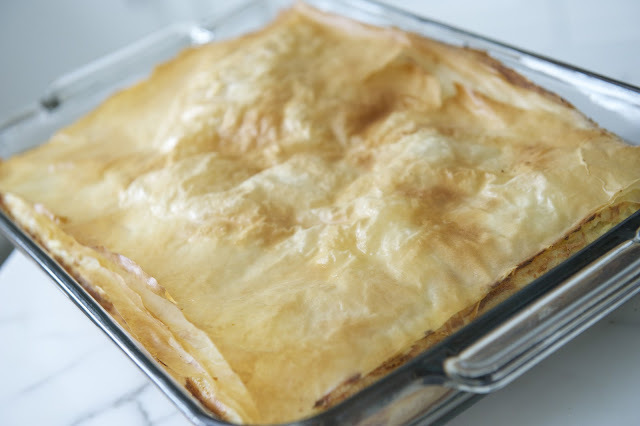 Take a sheet of phyllo and place into the baking dish. Allow the phyllo to overhang the dish. 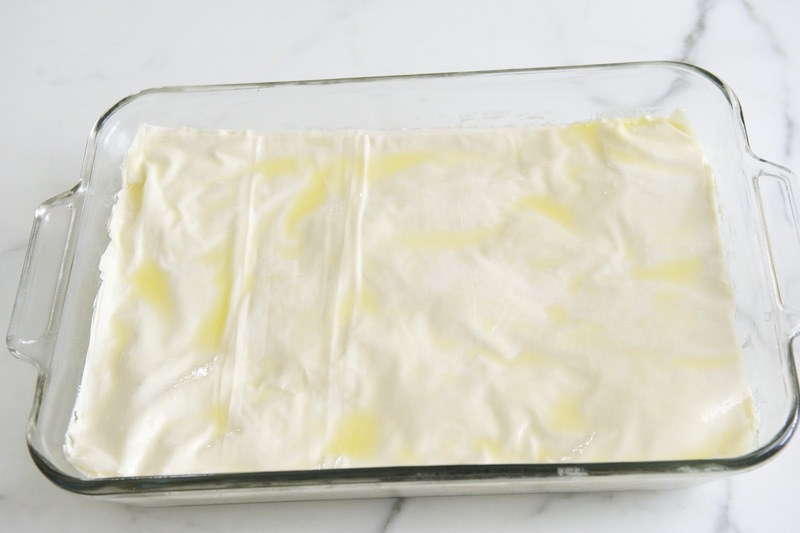 Brush oil or butter on the phyllo sheet. 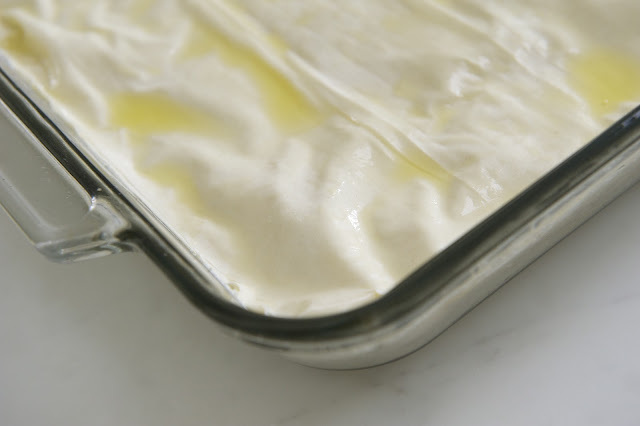 Using a 1/4 cup measuring cup, measure out two scoops of the cheese mixture and spread evenly over the phyllo layer. 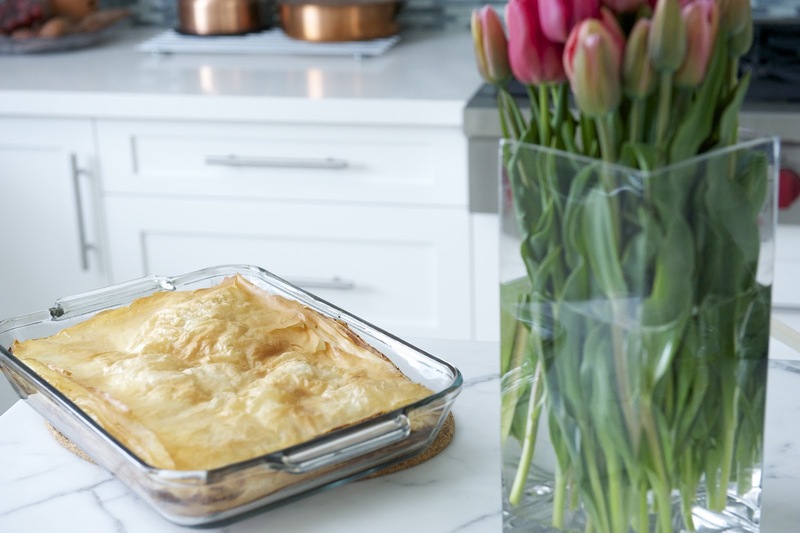 Repeat until you are finished with all the phyllo sheets. Tuck into the dish any of the phyllo overhanging the dish. Cut the reserved 4 sheets of phyllo to the size of the baking dish. Layer sheets on top of the pie, brushing with oil or butter. Finish with a brushing of butter or oil. Have ready some tin foil in case your Gibanica browns too quickly. Place the pie on middle rack and bake for 25 minutes. Check to ensure it's not burning. If it is browning too quickly, you can place the foil on top. Continue baking for another 15-20 minutes, keeping an eye on the bottom and top. Take it out of the oven when you see through the pyrex dish that the bottom is golden brown and the top is flaky and golden brown. Cut the cheese pie into squares and serve. Leftovers can be refrigerated. 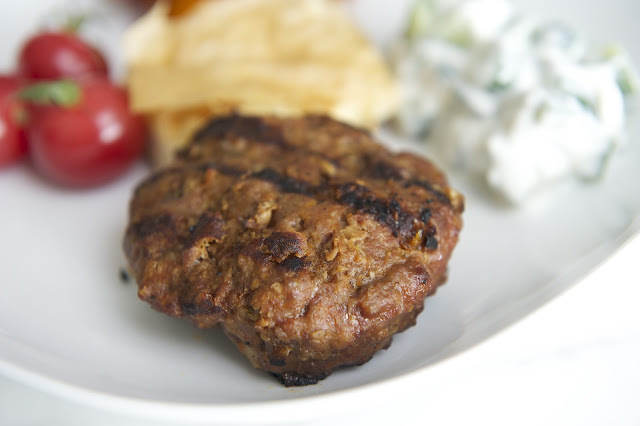 Gibanica can be eaten at room temperature or cold and is a delicious accompaniment to grilled meats. In a large mixing bowl, combine all the ingredients and mix thoroughly. Cover and refrigerate overnight to allow the flavours to combine. 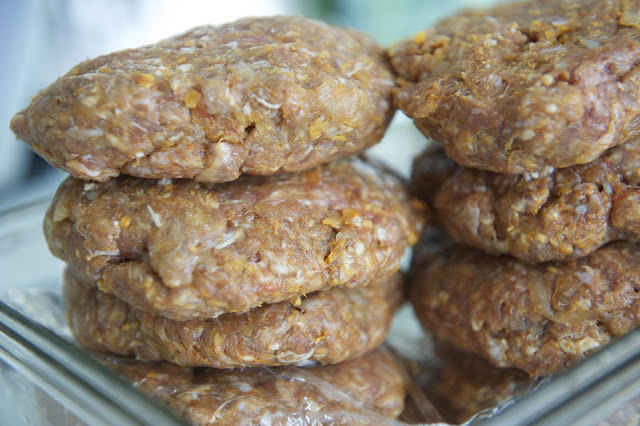 Form the meat into thin patties. 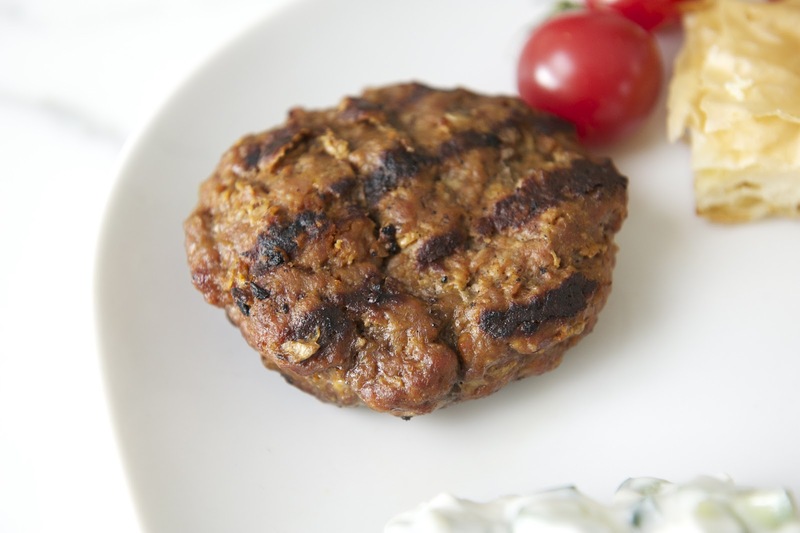 You may want to indent the centres of the patties because they will puff up in the centre when cooked. Grill the meat patties on the barbecue until done. mmm this looks so good, and so rich! like it would just melt in your mouth. There's the Balkan House in Burnaby and a new one my university boyfriend has told me about on Granville called V. In university I dated a Croatian fellow - I thought it was ironic when I read your post. There are many Slavic restaurants in Toronto, but I think it's more fun to try to create dishes at home. Let me know if you try the restaurants - maybe I'll check out V when I come home to visit this summer. hey cool! now we have a place to try out and compare against my memories! I couldn't find any restaurant called "V" on Granville. There's one on Mainland called VLounge but it's not Croatian (it's a type of Earls). Maybe it closed down? I checked out Balkan House on Urbanspoon and it looks promising! My Croatian colleague agreed with my suspicion about the secret ingredient being Vegeta. She said she buys hers at Stongs! I'm getting me some! Making more this weekend too! I checked with my old friend, he's now moved from Vancouver to he interior, but it seems V did close. Apparently it was on Granville near Nelson. I'm getting some Vegeta too. I have seen it at this German Grocery store in TO. I'll let you know how the meal turns out. Thanks for the fond memories. they were so good I DID make them the next week for the bbq and found some Vegeta at Superstore...putting that into the meat mixture. It tasted really close to what I had originally tasted at his house. Oh wow! never thought to use seltzer in the meat too! I'll try that! thanks! i still cannot get over your gorgeous kitchen!! oh and not sure if you saw my reply to you on my blog about dunking engineers at ubc. to my disappointment i've never seen nor heard about that event! hey lady where you been? i hope everything's okay! thank you for your comments! My friend is Serbian/Croatian (one parent is Serbian and the other Croatian) so I imagine that everything they I ate growing up at his house was both...and I don't think we ever discussed where Pljeskavica came from originally! I did look it up initially before posting this and all the bloggers and recipe sources in English seemed to call this savoury cheese pie thing "savoury cheese strudel". Perhaps this is because in America, if you called it a "Savoury Cheese Pie", it seems to connotate a pastry crust with a filling between two layers (like Chicken Pie of Apple Pie). In America, a strudel is something layered. Thus, these Serbo-Croatian-Americans use the term to indicate something that is like a strudel in technique but "savoury" in taste. So you say a "strudel" is supposed to be only sweet? I thought that a strudel just meant something made with lots of layers...I thought it was a technique in baking...there's also strudels from other countries (and I do agree strudels from other countries like Germany are always sweet). I just followed the lead of the name given to similar recipes from other Croatian bloggers and recipe writers who called it a savoury cheese strudel. Some called it Gibanica. Some called it Savoury Cheese Strudel. I don't think anyone ever did agree as far as I could tell because I was looking in comments and there was much debating about the terms. I have no idea. I don't even speak the language. Does this mean that this thing I made is called Burek? I read where one person said the terms are interchangeable and because I don't speak the language, I went with it! I have a Croatian colleague who I spoke to about the pljeskavica recipe. She gave me a bag of Vegeta! :) She advised me to shape it instead into little sausages and then it's called something else ( I forgot!) I also have a Serbian student and I talked to him about it. Seems as if everyone has their own version! It's all good though! Cittadella Caffe on Ash and Seventh (I think) has Slavic owners (Serbian I think again). The food and coffee are excellent but not Slavic at all, except for the ajvar like sauce that comes with entrees.